A triptych showing Prince Genji in a boat with attendant page and a lady watching female awabi (abalone) divers called ama. These women were a great curiosity for the public and seen as rather risqué characters. Prince Genji was the protagonist of Murasaki Shikibu’s Heian-era novel The Tale of Genji. He was the second son of the emperor, and relegated to civilian life. Published 1865 by Maruya Kyushiro. Very good impression and colour. Slight edge soil, otherwise very good condition. 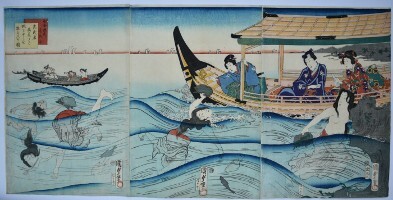 Signed Kunisada hitsu.